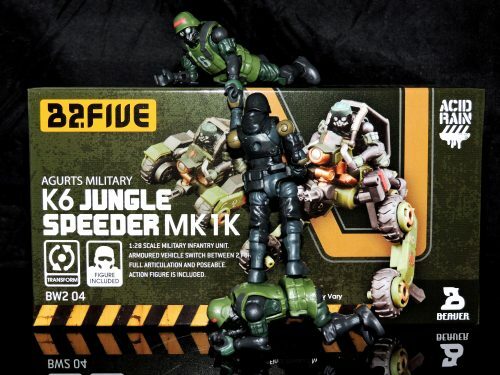 HissTank › Compatible Military Toys › B2.Five Acid Rain Agurts Military K6 Jungle Speeder MK1K Review Gallery by C.I.A.D. B2.Five Acid Rain Agurts Military K6 Jungle Speeder MK1K Review Gallery by C.I.A.D. Discuss on the HissTank Forums› Views: 1109 › Credit: C.I.A.D. The K6 Jungle Speeder MK1K is the 4th Speeder in the B2.Five Acid Rain World series, but the first assigned to the K6 Jungle Team. It’s color pattern is fantastic, mirroring those of the K6 Jungle Stronghold – Predominant Green and Gray throughout, with Gold accents and red highlights (including the K6 Logo), that really pop on this vehicle. Just as other speeders in the series, the K6 Jungle speeder has clamps that allow it to attach to the back of the K6 Jungle Stronghold like a backpack. Needless to say, it looks all sorts of cool. The K6 Pilot matches the theme perfectly, being cast in Green and Gray, with Red highlights. he has a removable vest and includes a pistol. He looks perfect alongside his K6 Jungle teammates and makes a welcome addition to the B2.Five Acid Rain Assortment. I love the speeder like a backpack. makes me smile every time. Do Acid Rain figures come with Aquatabs and quinine pills included or do you have to buy them separately..?